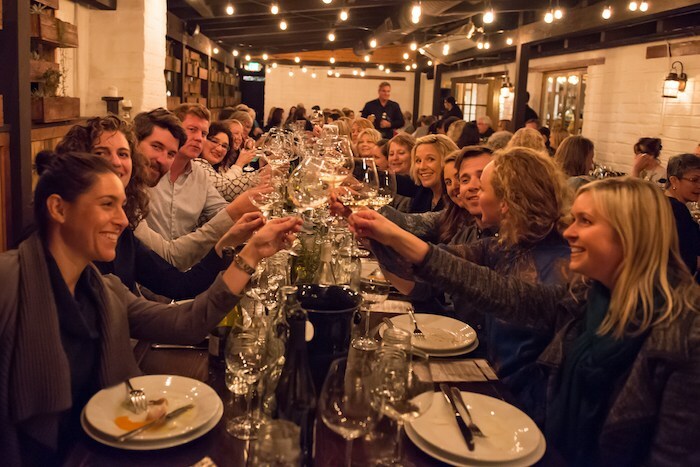 Patrons enjoy the 2018 Women Winemakers Dinner. Photo by Deborah Chadsey, In Paradise Photography. International Women’s Day is coming up soon, and I can’t think of a better way to toast the occasion than by attending the third annual Santa Barbara County Women Winemakers Dinner. I’ve been to the event every year and it’s a really delicious, heartwarming and fun evening—and it just keeps getting better and better! This year’s festivities benefit the Women’s Fund of Northern Santa Barbara County and bring together a great team of female winemakers, chefs, bakers and gourmet food purveyors. Taking place at K’Syrah Catering & Events (478 4th Place, Solvang, kscateringandevents.com) on March 8, more than 20 female winemakers will be joined by some of the Santa Ynez Valley’s leading culinary luminaries, who are collaborating to create a four-course, sit-down dinner to pair with the wines. In addition to the seated dinner portion of the night, this year’s event will once again feature more than 20 women winemakers at pre-dinner tasting reception, which includes passed appetizers and a cheese table. 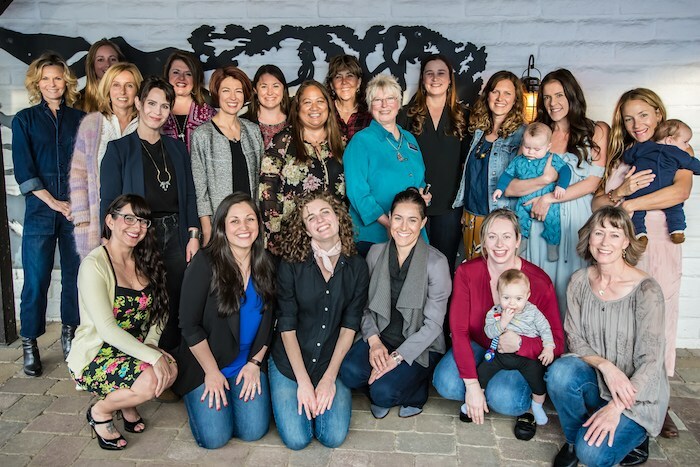 Karen Steinwachs, Buttonwood Farm & Winery winemaker and co-founder of the annual Women Winemakers Dinner, stands back row, center, among Santa Barbara County women winemakers participating Winemakers at the 2018 event. Photo by Deborah Chadsey, In Paradise Photography. Brit Zotovich, Dreamcôte Wine Co.
VIP-level tickets for this year’s event include both the tasting tent and the seated dinner, where guests will be treated to wine pairings by, and conversation with, an exclusive selection of some of Santa Barbara County’s female winemakers. A dessert reception will follow the seated dinner, where guests may continue to mingle with the winemakers. Chef Brooke Stockwell, Executive Chef at K’Syrah Catering & Events, will be joined in the kitchen by Baker Amy Dixon (The Baker’s Table, Santa Ynez), Chef Cynthia Miranda (The Lucky Hen Larder, Santa Ynez), Chef Golzar Barrera of the Santa Ynez Valley’s All Purpose Flower, Chef Louise Smith (Louise’s Kitchen Table and To-Go at The Castle, in Solvang), Theo Stephan (Los Olivos’ Global Gardens), Leyla Williams and the team at Solvang’s Good Seed Coffee Boutique, Lompoc’s Sweet Baking Co., Santa Ynez Valley Cheese Company and TV celebrity Chef Pink (Root 246, Solvang). 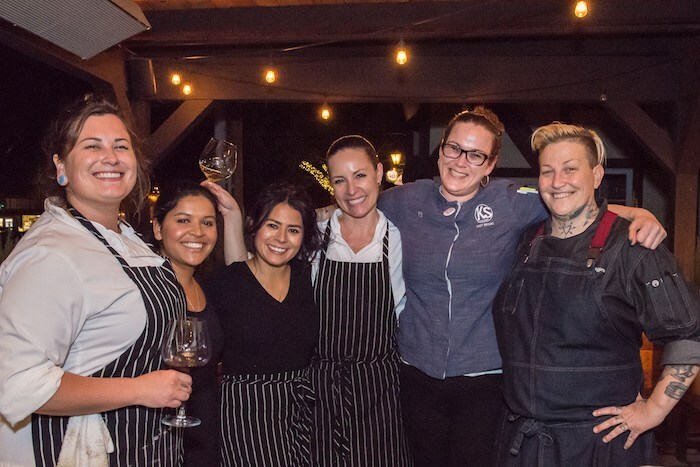 K’Syrah Catering & Events Executive Chef Brooke Stockwell (second from right), celebrates with collaborating Chefs Pink (aka Crystal DeLongpre, far right), Cynthia Miranda (center) and Alicia Valencia (third from left), after the 2018 Women Winemakers Dinner. Photo by Deborah Chadsey, In Paradise Photography. Tickets are available at womenwinemakersdinner2019.eventbrite.com. Tasting Tent Tickets (5:30 -7:30 p.m.), which include appetizers and wine tastings, are $50. VIP Tickets, which include the tasting tent and the seated, four-course dinner with wine pairings, are $125 (VIP level ticket seating is limited, advance ticket purchase is required). Proceeds benefit the Women’s Fund of Northern Santa Barbara County, a giving circle where individuals combine their money and/or time so that they can have a bigger impact on the causes most important to them, than they would by individually donating. In the past three years, the Women’s Fund of Northern Santa Barbara County distributed $140,000 in grants to organizations serving women, children, the arts and the community. This is sure to be a wonderful evening, and it’s certainly a great cause. Hope to see some of you there! Click here for more cocktail corner columns. Originally published in Santa Barbara Seasons on February 22, 2019. Santa Barbara County Women Winemakers Dinner is March 8.
International Women’s Day is coming up on March 8, and I can’t think of a better way to toast the occasion than by attending the second annual Santa Barbara County Women Winemakers Dinner. Last year’s festivities were, quite simply, amazing, delicious and fun, with a great spirit of collaboration and mutual admiration among the winemakers and chefs taking part. Because the inaugural event—which was planned, executed and sold out within the space of a few weeks—was so popular, the event’s organizers have expanded this year’s dinner to accommodate more guests and to provide different levels of options for participation and support. 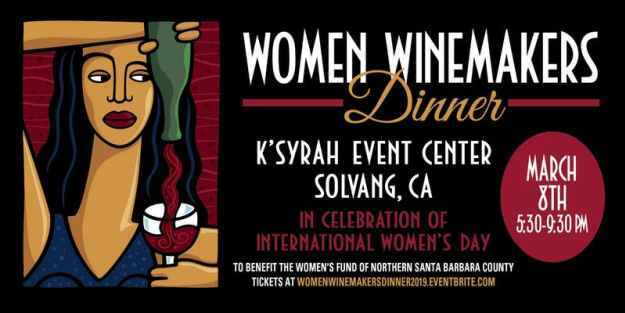 The charitable event, which runs in its entirety from 5:30-9 p.m. at K’Syrah Catering & Events (478 4th Place, Solvang, www.kscateringandevents.com) will, for the second year, benefit the Women’s Fund of Northern Santa Barbara County. Tickets to the March 8 event are currently on sale, at womenswinemakerdinner.eventbrite.com. Last year’s Women Winemakers Dinner, photos by Leslie Dinaberg. More than 20 female winemakers will be joined at the March 8 event by some of the Santa Ynez Valley’s leading culinary ladies, the latter of which are collaborating to create a four-course, sit-down dinner to pair with some of their winemaker colleagues’ wines. In addition to the seated dinner portion of the evening, this year’s event features a tent on a closed-to-traffic street in front of K’Syrah’s downtown Solvang venue. Housed inside the tent is a pre-dinner tasting reception (available as a separate ticket), where more than 20 women winemakers will be on-hand to pour tastes of their wines and talk with event guests from 5:30-7 p.m. The tent festivities also include passed appetizers and a cheese table from local female cheesemonger Janelle McAtamney of Solvang’s Cailloux Cheese Shop. Participating winemakers and wineries confirmed include: Karen Steinwachs, Buttonwood Farm Winery & Vineyard; Sonja Magdevski, Casa Dumetz Wines; Brooke Carhartt, Carhartt Vineyard & Winery; Alison Thomson, Lepiane Wines; Lane Tanner, Lumen Wines; Adrienne St. John, Rideau Vineyard; Gretchen Voelcker, Moon Unit Wines; Jessica Gasca, Story of Soil; Tara Gomez, Kitá Wines; Angela Osborne, A Tribute To Grace; and Kimberly Smith, LaMontagne Winery, with more to be announced soon. Chef Brooke Stockwell, Executive Chef at K’Syrah Catering & Events, will be joined in the kitchen by baker Amy Dixon, of The Baker’s Table in Santa Ynez; Theo Stephan, owner of Los Olivos’ Global Gardens; and additional Santa Ynez Valley chefs and food crafters, to be announced as the event nears. VIP-level tickets for this year’s event will include both the tasting tent and the seated dinner, where guests will be treated to wine pairings by, and conversation with, an exclusive selection of some of Santa Barbara County’s female winemakers, who will also be announced in the coming weeks. A dessert reception will follow the seated dinner, where guests may continue to mingle with the winemakers. International Women’s Day has been celebrated worldwide since 1909, with a focus on working women’s achievements and issues. In a working environment that sees about 10% of the global wine industry as female winemakers, Santa Barbara County boasts a much higher percentage of women winemakers than most places in the world, with nearly double the average. The March 8 event will bring together a good portion of the County’s female winemakers in a show of support for each other, and other working women, world-wide; those who toil and labor while honing and elevating their craft in their workplace, while also balancing work-lives with family and community service. It’s going to be a wonderful evening. Hope to see some of you there! Click here for more cocktail corner columns. Originally published in Santa Barbara Seasons on February 9, 2018. Local winemakers have been hard at work amongst the vines for the last few weeks, but now it’s time for them to take a break for the annual celebration of the year’s bounty. Celebration of Harvest Weekend is a time to enjoy the fruits of those labors, when vintners pour their wines, relax a little bit, and if you’re lucky, share their harvest tales with the winehounds among us. The Festival Grand Tasting is Saturday, October 11 from 1-4 p.m. at Old Mission Santa Ines in Solvang. All 100+ winery members of Santa Barbara Vintners will gather to present their wines, which are often poured by the winemakers themselves. 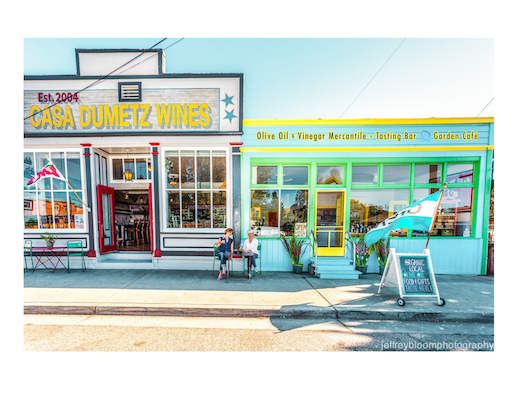 A ticket gets you unlimited wine tastings from Santa Barbara County wineries, food samplings from local restaurants, caterers, and food creators, pop-up wine seminars and live music from the Occasional Mustache and Donna Green and the Roadhouse Daddies. Everyone from Alma Rosa to Zotovich will be pouring, with food from a number of favorites, including The Willows, Trattoria Grappolo, Hitching Post II and Global Gardens. There are also a number of special events throughout the weekend, everything from winemaker dinners, library tastings, new wine releases and barrel tastings. On Saturday night there’s a special concert at Solvang Festival Theatre starring Toad the Wet Sprocket with special guests Jonathan Kingham and Tommy & the High Pilots. Also available just for the weekend are an all-inclusive tasting pass. You can purchase a Vintners Visa for unique and complimentary offerings at your choice of tasting rooms. For all the details on the Grand Tasting and special events, and to purchase tickets click here. Originally published in Santa Barbara Seasons on October 3, 2014. Vegetarians and locavores in the Santa Ynez Valley now have an entire restaurant devoted to their cuisine. Global Gardens’ Caliterranean Café features a fresh, rotating vegetarian menu with daily specials including phyllo “pitas,” stuffed French toast, a “daily dip,” hearty salads, the daily “pickle” and a weekly list of craft beers and local wines. All menu items are made with Global Gardens’ handcrafted olive oils and balsamic vinegars. Customers with a sweet tooth can choose from a selection of olive oil desserts including handmade olive oil ice cream, “Ani’s EVOO Ice Cream,” made by owner Theo Stephan’s daughter, Anita. The sweet treat comes in several flavors such as vanilla bean, coffee and lemon ginger. Global Gardens and the Caliterranean Café is open Thursday through Monday from 11 a.m. to 7 p.m. 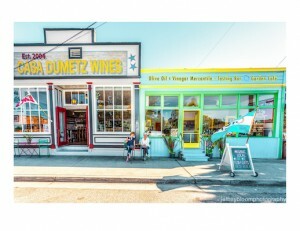 They are located at 380 Bell Street in Los Alamos. Originally published in Santa Barbara SEASONS on January 7, 2014.